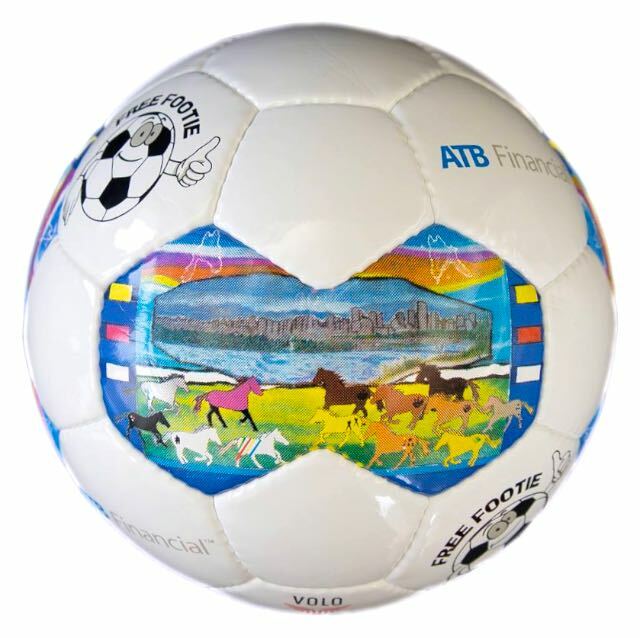 April 2016 – Every year VOLO Athletics works with Free Footie Soccer Society in Edmonton to create their club ball. This year they invited Cree Métis mixed media artist, Dawn Marie Marchand, to design an image for the ball. 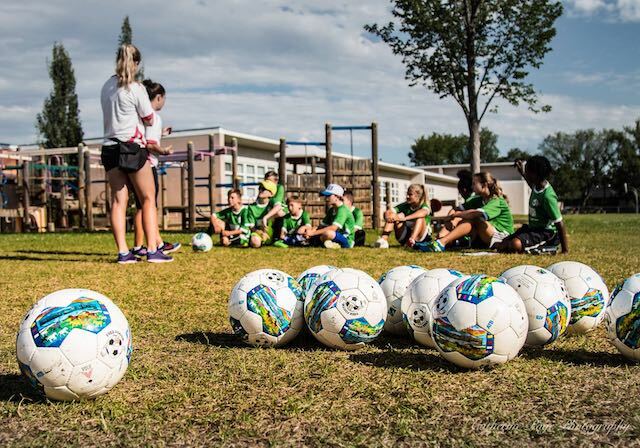 VOLO Athletics is thrilled to be in collaboration with Free Footie as the program provides incredible access to soccer for those who otherwise wouldn’t be able to play. Free Footie began, appropriately enough, with a group of kids kicking around a soccer ball at an inner city high school. Tim Adams was at the school for CBC radio and he stopped to watch. The kids had a lot of enthusiasm but no structure. Nobody to give them the guidance and support that many other kids get to develop their skills. The principal noticed his interest and invited him to start a team. 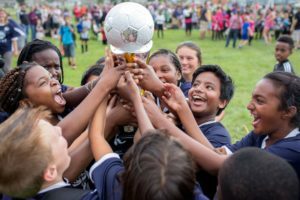 Fast-forward to today – now every spring Free Footie ensures that any girl or boy in Grades 3, 4, 5, 6 who attend schools in the areas they serve and wants to play soccer, can. There are no registration fees and every child is given a pair or shin pads, soccer socks, shorts, a ball and a jersey. As a Fairtrade Soccer Ball producer, VOLO Athletics has been producing their annual ball since 2014. Tim reached out to VOLO because there was a natural alignment between the Fairtrade model, his own values, and those which he wanted to reflect on the program. The attention this year’s ball has generated is incredible. 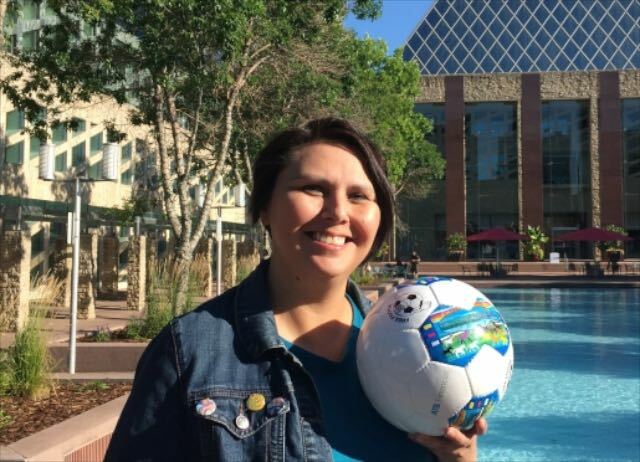 It has been so well received that Free Footie has used it as a fundraising tool, Dawn Marie has gained a new job as the first artist in residence for the City of Edmonton’s Indigenous Relations Office, and even our Prime Minister has been spotted with it! Congratulations Free Footie! 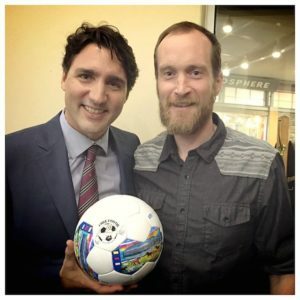 An amazing chance encounter for Free Footie Founder Tim Adams to show Prime Minister Justin Trudeau the Treaty 6 Fairtrade Soccer Ball.